Memory lapses are a frustrating part of menopause, not least because there are no outward indicators of the symptom. Struggling to concentrate, finding it difficult to adapt to changes in routine, and being unable to process new information as easily as you once could are all indicative of menopausal memory lapses. If ignored, these could damage your professional performance and personal relationships. 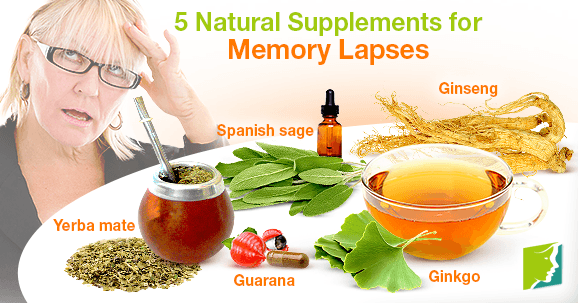 While memory lapses during menopause are caused primarily by the hormonal changes taking place during these years, supplementing your diet with herbal supplements that maximize mental awareness could help alleviate the symptom over time. Many rely on coffee to maximize concentration and increase mental sharpness. The long-term use of coffee could lead to bad breath, stained teeth, and indirect weight gain because of the added sugar and creamers that are typically used to mask its bitter taste. On the other hand, guarana (Paullinia cupana) powder mixed with water or supplements can help improve concentration and speed up brain processes, even with a lower daily intake. Ginkgo (Ginkgo biloba) has been used for centuries as a memory-enhancing herb, and there is some evidence to support the use of its extract for this purpose. It is thought that the herb exhibits properties that boost blood circulation to the brain to stimulate the cognitive functions and various neurotransmitters that control memory. Consuming gingko tea on a regular basis could, therefore, help alleviate memory lapses over time. Yerba mate (Ilex paraguariensis) is grown in the southernmost tip of South America, where it has been used for centuries to prepare a widely popular infusion. In recent years, a growing interest in the herb and its various health benefits has begun to develop in both Europe and the United States. The herb stimulates the central nervous system to increase mental alertness. Taking ginseng (Panax ginseng) supplements could improve short-term memory to help combat lapses. Its active ingredients, thought to be ginsenosides, are said to improve abstract thinking and reaction times, two key characteristics of memory. A close relative to the popular spice, recent research has suggested that the active ingredients in Spanish sage (Salvia lavandulaefolia) can stimulate the receptors in the brain in charge of short-term memory, and thus boost the recalling of information and the ability to learn new skills or retain new knowledge. The herb has exhibited mild success when used for this purpose to treat the symptoms of Alzheimer's disease. Using a sage tincture or drinking sage infusions could achieve this affect. Supplementing your diet with memory-enhancing herbs does not have to involve spending a lot of money or making big changes to your routine. Most herbs are affordable, and implementing them into your lifestyle is simply a question of remembering to take an herbal capsule with breakfast or substituting other beverages, like coffee or soda, during the day with an herbal infusion instead. For middle-aged women approaching menopause, taking hormone-regulating supplements will help treating the root cause of menopausal memory lapses. Memory Lapses during Postmenopause: Should I Be Worried? Memory lapses may be easy to manage when you are alone, but less so in the workplace. Find out how to effectively deal with menopausal memory lapses.